In typical May Lindstrom-style, the skincare chef has made the daily act of cleansing your face a luxurious ritual that commands a little bit of “me” time without requiring an all-out spa retreat on a busy weeknight. “The Honey Mud Gentle Cleansing Silk” gives you that little bit of aromatic, pampering escape that you need during your bedtime ritual without slashing too many minutes off your sleep time. This pre-mixed honey, oil and clay concoction takes the “just-add-liquid” aspect out of your skincare ritual. It instead allows you to have an easy-yet-beautiful natural cleanser to reach for on nights when you can’t take too much extra time yet still want to feel like you’re having a spa moment at home. On nights when you don’t feel up for mixing “The Clean Dirt” or putting together a DIY raw honey and oil cleanse, “The Honey Mud” offers you a pudding-like cleanser that feels thick and gently gooey without the skin-pulling or tugging that typically happens with pure honey cleansing. Massaging it in is feels like icing your face with the most rich, sinful chocolate and vanilla frosting. You get that chocolate high without any of the caloric guilt afterward; instead, your skin feels pillowy soft and your mind relaxed and at ease as you transition from bathroom to bedroom mentally prepared for sweet dreams. 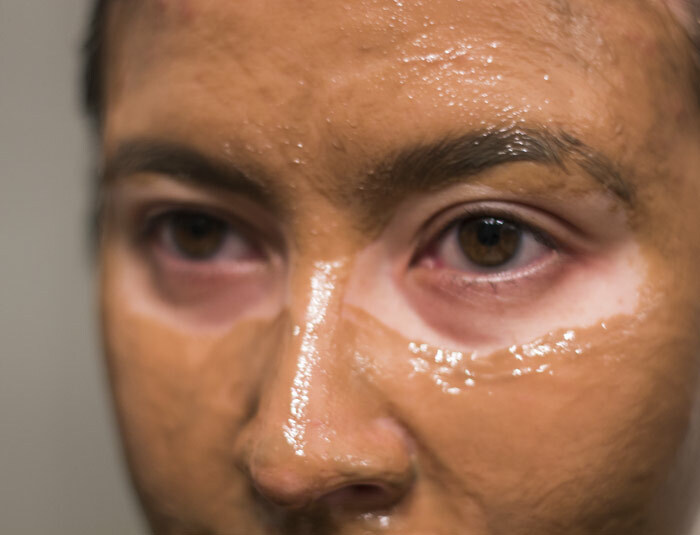 You can leave “The Honey Mud” on your face for 15 minutes or so if applied to dry skin, using it as a mask to gently de-gunk pores and intensely soften the skin. I also love playing skin chef myself by mixing “The Honey Mud” with “The Problem Solver” for the most spicy-yet-sweet mask. If time is of the essence, as it usually is, then simply apply “The Honey Mud” to damp skin to experience a milky emulsion that helps melt away makeup and impurities while stimulating your senses with its intoxicating scent. Let’s take a look at the ingredients in full and see what makes “The Honey Mud” oh-so-good. In addition to the naturally antifungal properties of raw honey, “The Honey Mud” calls upon witch hazel, frankincense and myrrh to help detoxify clogged pores. I’d love to hear some thoughtful responses from the green beauty community (May has addressed it in this No More Dirty Looks comments thread) about this naturally antibacterial ingredient — it’s seeing a bit of a renaissance among green beauty brands, especially for acne-clearing products, though has a bad rep among some who have taken it internally and had not-so-lovely experiences. The second ingredient, white halloysite clay, helps raw honey out in the de-gunking department, as this white clay is known for its gentle detoxification and purification properties. With these two hardworking, oil-unplugging ingredients, you’d think your skin may be left with that all-too-familiar tight feeling that you can sometimes get after using a clay mask. Not so with “The Honey Mud.” A smart mixing of protective macadamia nut oil keeps the skin hydrated and smooth, working in harmony with the other beneficial ingredients in this incredible, multipurpose treat. While I did have the luxury of trying “The Honey Mud” before spending $80 on it, I was all-too-excited to restock my supply; I scraped out the last smear of it and timed my final use of it perfectly for when I knew my paid order would come so I’d never be without it. This is the first May Lindstrom Skin product I’ve purchased (as I’ve been generously gifted samples of the other items from the line), and I would easily purchase it again and again and again. I think that “The Honey Mud” and “The Problem Solver” are the absolute must-haves from this beautifully curated line; if you have to start somewhere, start here! For those of you who are curious about “The Blue Cocoon,” the other new release from May Lindstrom Skin, I’ll have my review ready as soon as possible … maybe even this week. Would anybody be opposed to a double-dipped week of May Lindstrom Skin reviews? Have you tried “The Honey Mud” yet? Do you prefer to use it as a cleanser or a mask? How often do you use it? Tell me in the comments section!